These publications have been developed to help you carry out your role as a municipal official. Placemaking is a critical strategy for creating economically psosperous communities - large and small. The Michigan Muncipal League recofnized this over a decade ago through significant research, and has dedicated tremendous resources to advancing this strategy in Michigan and nationwide. As the League moves forward in pursuing programs and policies that support prosperous communties, it is important to pause and take stock of where the organization has been. This retrospective highlights the history of placemaking, the programs and efforts the League, with key partnerships, has undertaken in support of placemaking, and how those activoties have shaped policies and quality of life in Michigan communities. 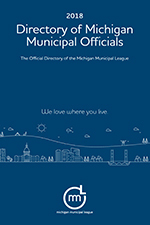 The Directory of Michigan Municipal Officials is the only place to find contact information for thousands of Michigan community leaders - everything from the phone number of the Addison village president to the address of Zilwaukee City Hall - plus demographic information on each community as well as the names of state and U.S. representatives. There's also easy-to-navigate information on Michigan Municipal League programs and services. The Directory Yellow Pages is the ‘yellow pages’ section of the Directory. It is the primary reference for local officials when they need advice, are seeking firms to bid on new projects, or want to find out what’s new in the industry. A complimentary directory is sent to all city managers and clerks, and mayors/presidents with populations of 4,000 and above. Complimentary copies will be mailed to the offices of your community but if you would like to purchase additional copies, they are available to League members at $15 each. Please note: This book is compiled once a year following the November municipal elections, and published the following spring. Click here for the online Directory Yellow Pages searchable by category or company. Click here for online directories for the State of Michigan and U.S. government agencies, as well as legislative contact information. This newly revised and greatly expanded handbook is essential reading material for both new and veteran elected and appointed officials in general law villages. Topics covered include basics of public service; the structure and function of village government in Michigan; specifics about the roles and responsibilities of general law village officials; options for delivering village services to residents; how to select and work with consultants; and in-depth tips about the operation of village government including written procedures, village financial operations, personnel and human resources issues, labor relations issues, risk management and environmental concerns. Numerous appendices cover the 1998 revisions to the GLV Act; a summary of other laws that affect GLVs; the full text of the Open Meetings Act and the Freedom of Information Act; sample rules of procedure for GLV council meetings; and five key sample ordinances. A Michigan Municipal League publication. Approx. 180 pages. Each year, dozens of mayors, city managers, and other local leaders give a "State of the City/Village" address in their communities in which they highlight key priorities, challenges, and accomplishments. The speeches help improve transparency and connect local leaders with their constituents. The Michigan Municipal League has published our Michigan: State of the Cities 2018 report summarizing key themes and priorities presented in these speeches. Modeled after the National League of Cities State of the Cities effort, the League's report highlights key findings in 11 top line categories such as economic development and public safety, and breaks down how the speeches addressed specific subtopics or issues within each of those broader categories. It provides a snapshot of the priority issues, challenges and accomplishments of municipalities across the state each year. This book was written to help new planning commissioners become effective commissioners. The topics covered include tools for planning commissioners, preparing for meetings, meeting the public, how knowledge of the zoning ordinance and applying ordinance standards will help you make decisions that will stick and what the future holds for planning commissioners. Written by Steve Langworthy, published by the Michigan Municipal League. 50 pages. all Retention and Disposal Schedules must be formally approved by the Records Management Services [in the Department of Technology, Management, and Budget], the Archives of Michigan and the State Administrative Board. Schedule #8, “Records Management Handbook: Guidelines and Approved Retention and Disposal Schedule for Cities and Villages,” originally published by the Michigan Municipal League, is an approved schedule. However, Records Management Services is updating it in sections, as separate schedules. If you have adopted and used Schedule #8, you now need to adopt the separate schedules that have superseded sections of this book. For instance, the Elections schedule (schedule #23) and the Clerks schedule (schedule #24) have superseded sections of the Records Management Handbook published by the League. If you are adopting it for the first time, you need to adopt schedules #23 and #24 with it. 3400 N. Grand River Ave. This manual is intended to provide the basics for restoring Michigan communities—building by building. It focuses on the problems faced by the largest and the smallest of our communities. How do we effectively deal with dangerous and unsafe buildings? How can we best address the problems of litter, overgrown weeds, and abandoned buildings? We do so by acknowledging that the problems, unless dealt with effectively and quickly, not only impede our community progress but also sap our community spirit. We know that vibrant communities have, in common, walkable downtowns, flourishing retail districts, exciting cultural opportunities, affordable housing and educational opportunities. We also know that favorable design concepts promote mixed-use, walkable neighborhoods that work to retain and attract young people and their employers to Michigan and the “new retirees” of the baby boomer generation. We know what works—we need to make sure that we have in place the tools that permit us to create vibrant communities in our downtowns, neighborhoods and regions. This handbook was written to help new zoning board of appeals members understand the scope of their role and responsibilities, and to provide them with a basis of understanding in order to capably perform their duties within the law. Topics covered include: the role of the ZBA as a whole and as individual members; an explanation of the zoning enabling acts; the ZBA's relationship to other municipal bodies and individuals; how to identify and handle conflicts of interest; hot to interpret a zoning ordinance; types of variances; preparing for and conducting meetings; and guidelines for making tough decisions. Written by Steve Langworthy. 40 pages.